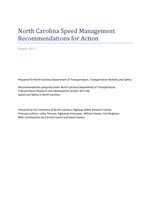 The recommendations in this report are based on problems identified in North Carolina through a review with key agencies and stakeholder meetings, and are based on best practices in speed management and the evidence of what works to reduce speeding-related crashes and injuries. A speed symposium and workshop was held in October 2011, and a number of issues and strategies were identified during that workshop. Fifteen potential strategies are organized by: Management strategies: those that are deemed crucial for establishing a sustainable and credible speed management framework; Engineering; Enforcement; Education and public information; and Information technologies. In addition, six unproven innovative strategies with potential are described. These strategies lack a clear track record of effectiveness, but are promising in terms of preliminary data or fitting speed management principles that aim to create a safe system for road users. To provide further guidance in countermeasure selection, the strategies are also categorized according to whether they are proven measures, tried (and promising), or experimental. “Tried” or “experimental” strategies that have little chance of working were not included.